By "flying qualities" are meant the stability, and control characteristics of an airplane that have an important bearing on the safety of flight and on the ease of controlling an airplane in steady flight and in maneuvers. The term "handling qualities," which is applicable to other types of vehicles is used synonymously with flying qualities when applied to airplanes. To start the discussion of flying qualities, the concept of stability should be understood. Stability can be defined only when the vehicle is in trim; that is, there are no unbalanced forces or moments acting on the vehicle to cause it to deviate from steadyflight. If this condition exists, and if the vehicle is disturbed, stability refers to the tendency of the vehicle to return to the trimmed condition. If the vehicle initially tends to return to a trimmed condition, it is said to be statically stable. If it continues to approach the trimmed condition without overshooting, the motion is called a subsidence. If the motion causes the vehicle to overshoot the trimmed condition, it may oscillate back and forth. If this oscillation damps out, the motion is called a damped oscillation and the vehicle is said to be dynamically stable. On the other hand, if the motion increases in amplitude, the vehicle is said to be dynamically unstable. The theory of stability of airplanes was worked out by G. H. Bryan in England in 1904 (ref. 4.1). This theory is essentially equivalent to the theory taught to aeronautical students today and was a remarkable intellectual achievement considering that at the time Bryan developed the theory, he had not even heard of the Wright brothers' first flight. Because of the complication of the theory and the tedious computations required in its use, it was rarely applied by airplane designers. Obviously, to fly successfully, pilotless airplanes had to be dynamically stable. The airplane flown by the Wright brothers, and most airplanes flown thereafter, were not stable, but by trial and error, designers developed some airplanes that had satisfactory flying qualities. Many other airplanes, however, had poor flying qualities, which sometimes resulted in crashes. Bryan showed that the stability characteristics of airplanes could be separated into longitudinal and lateral groups with the corresponding motions called modes of motion. These modes of motion were either aperiodic, which means that the airplane steadily approaches or diverges from a trimmed condition, or oscillatory, which means that the airplane oscillates about the trim condition. The longitudinal modes of a statically stable airplane following a disturbance were shown to consist of a long-period oscillation called the phugoid oscillation, usually with a period in seconds about one-quarter of the airspeed in miles per hour and  a short-period oscillation with a period of only a few seconds. The lateral motion had three modes of motion: an aperiodic mode called the spiral mode that could be a divergence or subsidence, a heavily damped aperiodic mode called the roll subsidence, and a short-period oscillation, usually poorly damped, called the Dutch roll mode. By the 1930's, there was a general feeling that airplanes should be dynamically stable, but some aeronautical engineers were starting to recognize the conflict between the requirements for stability and flying qualities. To resolve this question, Edward ~ Warner, who was working as a consultant to the Douglas Aircraft Company on the design of the DC-4, a large four-engine transport airplane, made the first effort in the United States to write a set of requirements for satisfactory flying qualities. Dr. Warner, a member of the main committee of the NACA, also requested that a flight study be made to determine the flying qualities of an airplane along the lines of the suggested requirements. This study was conducted by Hartley A. Soulé of Langley. Entitled Preliminary Investigation of the Flying Qualities of Airplanes, Soulé's report showed several areas in which the suggested requirements needed revision and showed the need for more research on other types of airplanes (ref. 4.2). As a result, a program was started by Robert R. Gilruth with Melvin N. Gough as the chief test pilot. It was during the course of this program that I entered the Flight Research Division and my early work consisted largely of flying qualities investigations. An important quantity in handling qualities measurements in turns or pull-ups is the variation of control force on the control stick or wheel with the value of acceleration normal to the flight direction expressed in g units. This quantity is usually called the force per g. This notation will be used in this monograph. By the time I started work, Mr. Gilruth had tested about 16 airplanes. These airplanes ranged from light airplanes to the largest airplane then available, the I SO-foot span Boeing XB-15 bomber. Based on these tests, Gilruth prepared a report, Requirements for Satisfactory Flying Qualities of Airplanes, that was published as a NACA Technical Report in 1943, but was available in preliminary form when I arrived at Langley (ref. 4.3). This report served as the basis for much of the work of the Stability and Control Section during the ensuing years. After a period of indoctrination, I was the engineer in charge of the flying qualities measurements. 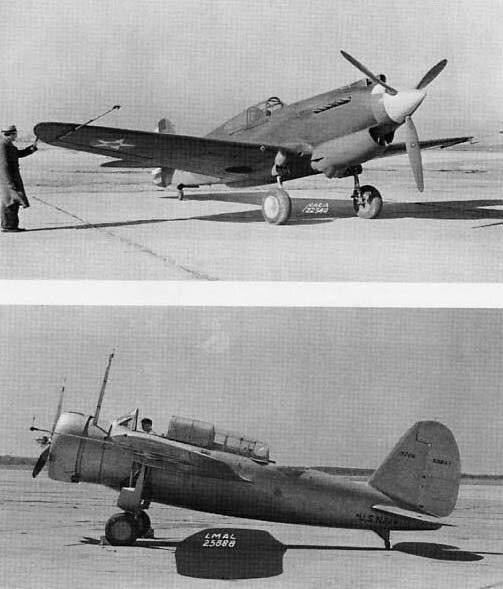 Pictures of me with two of the airplanes tested are shown in figure 4.1. My name first appeared on reports on the flying qualities measurements of the Vought Sikorsky XF4U-I Corsair airplane, a Navy Fighter well-known for its service in WW II (figure 4.2). FIGURE 4.1. Pictures of me with two of the airplanes tested in my first years at the NACA. 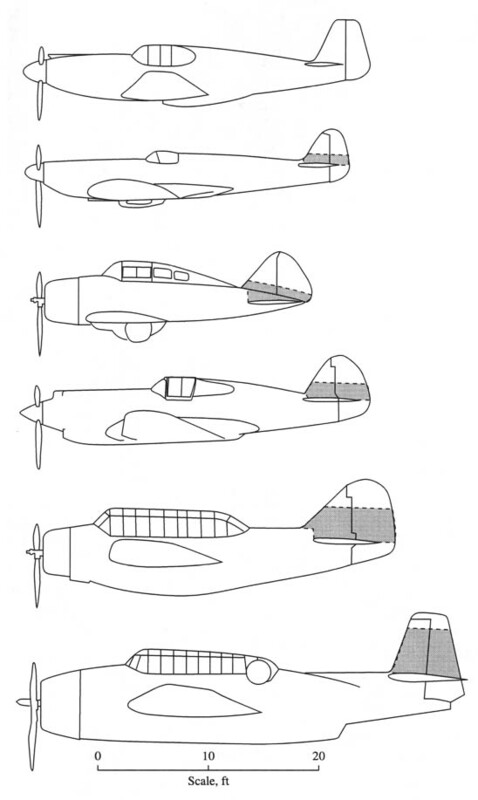 (a) Curtiss P-40 fighter (top). (b) Brewster XSBA-1 scout bomber (bottom). This study had been started before I arrived and my main contribution was to edit the text. The first published NACA report for which I supervised the tests (May 1941) was on the flying qualities measurements of a Curtiss P-40 airplane (ref. 4.4). 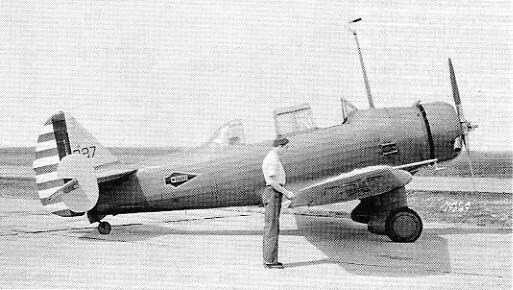 This airplane was the primary U.S. fighter at the start of WW II (figure 4.3). Need for some improvement on the handling qualities of this airplane was shown by several ground-looping accidents directly in front of my office windows as the Air Force squadrons came in for landings. After the start of WW II, the famous British fighter airplanes, the Hawker Hurricane, (figure 4.4) and the Supermarine Spitfire (figure 4.5) were obtained for tests at Langley. Brief summaries of some of the measured flying qualities of interest are included in the figure captions of these and other airplanes. FIGURE 4.2. Vought Sikorsky XF4U-1 airplane. The flying qualities of this airplane are of interest as one that was in service before the publication of Gilruth's flying qualities requirements. The elevator control forces in turns were found to be desirably light, but the aileron forces in high-speed rolls were heavy, resulting in sluggish response. The rudder force variation with speed for trim in high-speed dives and strafing runs was large, resulting in difficulty in holding the sights on an aim point. Control forces in the carrier approach condition had an unstable variation with speed, a common condition that does not have a very adverse effect on the flying qualities. FIGURE 4.3. Curtiss P-40 airplane. This airplane at the start of the war was lightly armed and underpowered compared to British and German fighters. Its flying qualities were satisfactory except for the usual heavy aileron control forces. Stalling characteristics were poor in some conditions. The airplane had a particularly bad tendency to ground loop, which was found to be caused by asymmetrical stalling of the wing in the three-point attitude. This problem was cured by extending the tail-wheel strut so that the airplane remained unstalled on the ground. FIGURE4.4. Hawker Hurricane airplane. A heavily armed fighter airplane noted for its role in the Battle of Britain, the Hurricane's flying qualities were found to be generally satisfactory. The most notable deficiencies were heavy aileron forces at high speeds and large friction in the controls. FIGURE 4.5. Supermarine Spitfire airplane. A high-performance fighter noted for its role in the Battle of Britain and throughout WW II, the Spitfire had desirably light elevator control forces in maneuvers and near neutral longitudinal stability. Its greatest deficiency from the combat standpoint was heavy aileron forces and sluggish roll response at high speeds. I published reports on the Hawker Hurricane (April 1942) (ref. 4.5) followed shortly by one on the Spitfire. The data obtained in these tests served to confirm most of the requirements previously proposed by Gilruth. Other reports followed comparing these results with published data on the German fighter Me109 and with U.S. fighter airplanes. During the war, pilots' lives depended on small differences in performance between the first-line fighters, and continual detailed improvements were made in these fighters. Several research studies were made on improvements, usually on control systems, and close contact was kept with the manufacturers through conferences and preliminary reports. The tests on the high-speed fighters confirmed the findings of Gilruth that though all the airplanes exhibited instability in the spiral and phugoid modes of motion, these  modes did not concern the pilot because his normal control actions prevented the modes from developing to a point that they were noticeable. That is, the airplanes were spirally unstable, but the rate of divergence was small enough that it was not discernible to the pilots. Also, the long-period longitudinal mode might have been a slow divergence or a poorly damped or unstable phugoid oscillation, but the divergence was so slow or the oscillation had such a long period that it was not noticeable in normal flight. The short-period lateral oscillatory mode, the Dutch roll, was noticeable but adequately damped and the short-period longitudinal mode was so well damped that it could not be detected by the pilots. In general, these results applied to most airplanes of this period and explain why successful airplanes could be built without the need to consider theoretical predictions of dynamic stability. On the other hand, Gilruth had found that many of the quantities that could be determined without the need for complex theories, such as control deflections and control forces required in straight flight and maneuvers, trim changes due to power and flap setting, limits of rolling moment due to sideslip, and adequacy of the control effectiveness in maneuvers, were extremely important to the pilot. The tests on the fighter airplanes showed that the longitudinal control force gradient in maneuvers, known as the force per g, was a very important quantity, whereas the control force and position variation with speed in straight flight was of less importance and mainly influenced pilot fatigue on long flights. These airplanes were found to be quite satisfactory in most respects, though the aileron effectiveness at high speeds was low because of the large control force required to deflect the ailerons, which was an adverse characteristic in air combat. The detailed improvements mentioned previously were mainly directed at this aileron effectiveness problem. In addition to analyzing the flight test data, I did theoretical analyses showing the relation between the airplane design characteristics, such as the center-of-gravity location, tail size, and control surface design, and the resulting flying qualities. Stalling characteristics are an important consideration in studying flying qualities because many accidents have resulted from poor stalling characteristics. The design features leading to poor stalling characteristics were at that time, and to some extent still are, poorly understood because stalling is a complex problem involving separated flow. Separated flow occurs when the thin layer of slowly moving air near the surface of the wing, called the boundary layer, thickens and causes large changes in the external flow. My first assignment at Langley was to analyze data and plot figures from stall tests of the North American BT-9B airplane, a trainer that had displayed dangerous stalling characteristics (figure 4.6). FIGURE 4.6. North American BT-9B airplane. This airplane had displayed violent roll-off at the stall with no warning, a particularly unsatisfactory condition in a trainer. ....reports of that time, the desire was to present a straightforward set of conclusions. As a result, this report was never published, but I have always kept a copy of the rough draft. Through the years, when questions arose concerning the stalling characteristics of airplanes, it was usually possible to find some applicable information in the BT-9 data. A project using the Brewster XSBA-I airplane was started some years before I came to work at Langley. In this designation, X stands for experimental, SB for Scout Bomber, and A for the Brewster Aircraft Company in Long Island, New York, which failed due to labor troubles and was taken over by the Naval Aircraft Factory. This project, a joint effort by the Navy and the NACA, involved testing a series of horizontal and vertical tail surfaces of different sizes and different ratios of control surface chord to main surface chord. Also, shims were provided to attach the wing panels to the fuselage at different values of dihedral angle. Though I am not familiar with the thinking that led to this project, the objective was probably to supply designers with systematic design data for obtaining desirable flying qualities on new Navy airplanes. The airplane was quite up-to-date at the time it was designed in the 1930's, but rapidly became obsolete with the advance of military aircraft design. As a result, the studies conducted were of little interest for this particular airplane, but were considered to have general research interest. I was given the job of performing research on the effects on flying qualities of the different configurations (figure 4.1). The project obviously generated much less enthusiasm than tests of the latest fighter airplanes, but I dutifully ran tests on the original configuration and on the first tail modification and wrote reports on the results. Later two other combinations were tested, one with a different vertical tail and one with increased dihedral. To some extent, these projects were used for education of some of the new engineers. The last report was not published until 1946. The entire project on the XSBA- I is an excellent example of a study that is unsuited for flight research. The design and construction of flight-worthy components is a lengthy  process and the installation of these parts on an airplane in the field is also very time-consuming. The number of possible combinations to be tested is excessive, and if a thorough study of each were made, the project would last a lifetime. The items chosen for test were not the most critical for obtaining good handling qualities and the effect of the configuration changes could have been predicted with sufficient accuracy from available knowledge. Some effects, such as the effect of dihedral, were known even to the Wright brothers. Had complete tests been conducted, the data would not necessarily be applicable to airplanes of different design. The method chosen by Gilruth of making detailed studies on many available airplanes of different designs proved to be much more effective in yielding new knowledge that is applicable to future designs. This method has been used by all the NACA Research Centers, the military services, and industrial organizations ever since his early work. Flying qualities studies continued at Langley until the start to the space program in 1958. In chapter 16 of this volume, an account is given of the last test made at Langley on a high-speed fighter airplane, the Vought F8U-I. In 1988, I wrote a summary report, Flying Qualities from Early Airplanes to the Space Shuttle, that was presented as the Dryden Lecture of the American Institute of Aeronautics and Astronautics (ref. 4.6). The short-period longitudinal oscillations of all airplanes of the period prior to WW II were well damped. The only cases encountered in which this motion was considered unsatisfactory involved coupling between the elevator motion and the airplane motion with the control free. This problem had been observed on the Lockheed 14A transport airplane on which the elevators were not mass balanced (figure 4.7). This type of oscillation could become quite violent. As a result, engineers at Langley were working on methods to predict these problems. A study in progress when I arrived at Langley was measurement of longitudinal oscillations with free elevator control for a Fairchild XR2K-I airplane (Navy designation for the Fairchild 22, a parasol-wing light plane). Robert T. Jones and his coworkers in the Stability Research Division had published a series of reports on the effect of free controls on the stability of an airplane, thereby extending the existing theory about the stability with controls fixed. To check this theory, William Gracey in the Flight Research Division had modified the longitudinal control system of the XR2K- I to include a link with movable weights so that the inertia of the longitudinal control system could be varied. This system was closely related to the device that I had tried on the towline glider at MIT. I discussed the analysis that I had made at MIT. As a result, I became acquainted with Robert T. Jones and was given some responsibility in running the tests. One highlight of the tests was to measure the damping of the elevator oscillations in the Langley Full-Scale Tunnel where the airplane had been mounted for other studies. Motion of the elevator was recorded when the control stick was deflected and released. It was a bitterly cold day when the tests were made with the temperature in the tunnel near freezing. I climbed up a ladder into the open cockpit bundled up in an overcoat, which provided little protection when the airspeed was increased to 100 miles per hour. I served as the "pilot" to deflect the control stick abruptly and record the motions of the elevator. In my entire experience at Langley, I never had the opportunity to run another wind-tunnel test until after I had retired. The Fairchild tests correlated poorly with theory because of excessive friction in the control system, but the results were nevertheless published as an Advance Restricted Report (ref. 4.7). FIGURE 4.7. 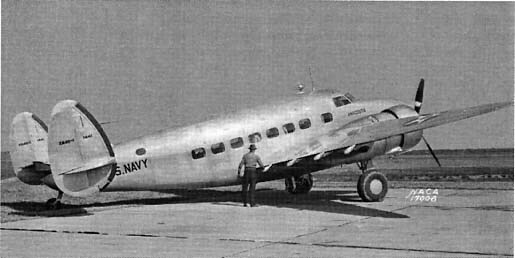 Lockheed 14H transport airplane, a later model of one of the original 16 airplanes on which Gilruth's flying qualities requirements were based. This airplane exhibited a coupling between the longitudinal oscillation of the airplane and the motion of the mass unbalanced elevator, which proved very objectionable in rough air. This experience resulted in a requirement to rule out such oscillations, which may result from a variety of causes. Almost all full-scale airplanes exhibit an instability in which the airplane, when the controls are held fixed in level flight, gradually veers off into a diving turn or spiral. This instability, called spiral instability, had been known since the earliest days of aviation, but was generally ignored because instinctive control inputs by the pilot correct the condition so readily that he is rarely aware of its existence. To apply these control inputs, however, the pilot must have a reference with which to judge the attitude, either from the horizon or from cockpit instruments. Without such a reference, the pilot in an airplane is completely unable to determine the attitude, because the familiar vertical reference supplied by gravity is combined with forces in other directions caused by the accelerations of the airplane. Student pilots or other pilots, who are not sufficiently proficient in instrument flying, frequently get in to such a spiral when they fly into a cloud or fog bank. The maneuver has been called the "graveyard spiral" because so many pilots have been killed by it. Despite many efforts over the years to make this motion of the airplane inherently stable, no solution had been obtained that did not have other serious unacceptable consequences. Gilruth suggested a possible solution consisting of a downward-deflected fixed tab on each aileron. These tabs would tend to make the ailerons float up. Because the ailerons are interconnected through the control system, they would not float up, except possibly a small amount due to flexibility of the control system. In a turn, however, the outboard tip would be traveling faster and the aileron on that tip would have greater tendency to float up than the one on the inboard tip. The result would be to cause the aileron system to deflect in a direction to oppose the turn. I undertook the job of analyzing this arrangement. At first, the idea seemed promising because for the example chosen, the aileron motion would be sufficient to make the airplane spirally stable up to a lift coefficient value of 1.5, which corresponds to a low-speed flight condition in which the spiral stability is normally most severe. In an actual airplane, however, the aileron movement is opposed by friction in the control system. I then calculated how steeply the airplane would have to turn to cause the ailerons to start to move against the control system  friction. Using the measured aileron friction in the Curtiss P-40 fighter airplane, which amounted to 1.5 foot-pounds per aileron at any reasonable value of airspeed, the results showed that the ailerons would never develop enough hinge moment to overcome the static friction. This result is typical for all such schemes that attempt to eliminate spiral stability. The motions are so slow that the aerodynamic hinge moments involved are small, and any friction moments are sufficient to overshadow them. Even on an airplane that is inherently spirally stable, the friction force in the controls has usually been found to be sufficient to hold the airplane in a banked turn that, without pilot intervention, would lead to a spiral dive. A more sophisticated system, consisting of an autopilot with sufficient force output to readily overcome control system friction, is required to make an airplane spirally stable in practice. This example is typical of studies that I made, occupying less than a week of work, that revealed information of value over the years in discussions with manufacturers or with other workers at Langley who were not always familiar with the practical aspects of airplane operation. Another stability problem that was quite common in airplanes of the period around WW II was a tendency for a continuous small-amplitude lateral oscillation in straight and level flight. This problem was called "snaking" and its cause was quite mysterious. Among the explanations offered were response of the normal lateral oscillation of the airplane to continuous small-amplitude turbulence, periodic flow separation from the wing root that affected the vertical tail, or nonlinear aerodynamic characteristics of the wing or tail surfaces for small changes in angle of attack. One explanation, which will be discussed subsequently, was the unsteady lift characteristics of the vertical tail at low frequencies. While some of these explanations may have had some influence in rare instances, the true explanation was first given by George Schairer of the Boeing Company in an analysis of this problem on the Boeing 314 flying boat, one of the China Clippers. He pointed out that at small angles of sideslip, the rudder had a tendency to float against the relative wind, which caused the airplane to swing around and yaw in the opposite direction. Friction in the rudder system, however, held the rudder in this position as the airplane swung through zero sideslip. On reaching a sideslip in the opposite direction, the rudder hinge moments would eventually break through the friction force and the cycle would be repeated in the opposite direction. Thus, energy was fed into the oscillation by the rudder, which caused the oscillation to build up to an amplitude where this energy equaled that removed by the inherent damping of the airplane. On learning of this explanation, efforts were made to verify it. A convenient test airplane was the Fairchild 22 on which an experimental all-moveable vertical tail had been installed. This type of tail surface was an invention of Robert T. Jones and had the advantage that hinge moments due to angle of attack and due to deflection could be adjusted separately with changes in the hinge location and tab gearing. The tests were made covering a range of conditions and friction values, and the validity of the theory was established (ref. 4.8). The question arises as to how such an apparently obvious control motion could have escaped detection. The explanation is that because of the relatively low damping of the Dutch roll oscillation, the rudder motion required to sustain a constant-amplitude oscillation is only a small fraction of the amplitude of the yaw or sideslip. For example, in a typical snaking oscillation of plus or minus two degrees of sideslip, the rudder motion required might have been only plus or minus two-tenths of a degree. This small motion was less than the sensitivity of control position recorders used at that time, and  this motion could be absorbed by stretch in the control cables without being felt at the pilot's rudder pedals. Another little-known aspect was the tendency of the rudder to float against the relative wind at small sideslip angles. Most control surfaces float with the relative wind at larger sideslip angles. In typical wind-tunnel tests, measurements had been made at increments of angles of attack or sideslip of five degrees, and as a result, the small changes in characteristics at very small values of angle of sideslip were not detected. In addition to flight tests, theoretical studies were made to explain and quantitatively predict the oscillation. These studies are discussed in a subsequent chapter. For many years, aeronautical engineers instinctively built airplanes with a symmetrical configuration. The aerodynamic symmetry is destroyed, however, by the engine torque and the rotation of the slipstream. On many early airplanes, the fin was offset to attempt to align it with the rotating slipstream and to reduce the rudder forces to maintain trim in takeoff and climb conditions. With the greatly increased power and speed range of fighter airplanes in WW II, the ability of the rudder to trim the airplane became a serious problem. If the fin was offset to attempt to trim the airplane at low speed, the rudder pedal force to maintain an aim point on a target in a high-speed dive frequently exceeded 100 or even 200 pounds. The pilots could exert these forces, but the aiming accuracy was found to be very adversely affected by the large and varying forces. Model airplane builders had long ago encountered the problem of very high propeller torque on rubber-powered models. The effect of this torque relative to the aerodynamic forces on the wings was larger than that encountered on even the highest powered fighters because the models had power to climb vertically, whereas the fighters did not. The model builders, less inhibited by their training than full-scale airplane designers, had found that the propeller torque could be handled by offsetting the wing laterally. I therefore did not hesitate to suggest this solution for the problem on the full-scale aircraft. Tests were run on the Brewster XSBA- I, which provided another useful research application of this airplane. Though the wing could not be offset laterally, the same effect could be obtained by shifting the center of gravity laterally by unsymmetrical loading of the wing fuel tanks. For a conventional propeller turning clockwise when viewed from the rear, the center of gravity should be offset to the right. The method was found to reduce greatly the rudder deflection for trim in low-speed, high-power conditions (ref. 4.9). This method is highly effective because three separate effects combine to reduce the rudder deflection. The reduced aileron deflection reduces the adverse yaw, the gravity component along the longitudinal axis provides a yawing moment, and the left sideslip required to maintain straight flight is reduced. (This sideslip is required to offset a combination of the side force on the fuselage due to slipstream rotation and the side force on the vertical tail due to rudder deflection.) All these effects are in the direction to reduce the rudder deflection. In high-speed dives, use of an offset fin or any other structural deflection gives a moment that increases as the square of the airspeed, which results in rapidly increasing rudder forces to maintain trim, whereas the offset center of gravity provides a moment that does not vary with speed. These effects had been known to some airplane designers as early as WW I, but the effectiveness of this technique on high-powered airplanes was not widely recognized. My work on flying qualities research continued during and after the period of WW II. As head of the Stability and Control Section, I had the responsibility for analyzing the data and writing reports on many of these tests. I did not do this alone, of course. By the time I had worked at Langley for 3 or 4 years, the measurement of flying qualities had become a somewhat routine procedure, and the members of the section were assigned as project engineers on the various airplanes under test. The results of these studies were still of great interest, because something new about handling qualities was learned from nearly every airplane that was tested. A great deal of my time, however, was spent in reviewing and correcting the various reports that were produced and in bringing their quality up to the high standards that had become traditionally associated with NACA reports. One aspect of work at NACA that I considered very desirable was that there were always many challenging technical problems to work on, but if at times I lacked the inspiration or ambition to tackle such problems, there was always plenty of routine work to occupy the time. Reviewing the reports put out by the engineers was one such task. Many of the engineers hired during the period of rapid expansion during WW II lacked the extensive technical background or report-writing ability to meet the standards established in earlier years. I spent a lot of time with the engineers with less training to improve their skills. At the time, this seemed a thankless task, but in later years many of these engineers went on to high positions in industry or in the space program, and I was credited by some of the engineers with helping them to gain some essential knowledge required for their careers. Meanwhile, I worked on many specialized technical problems. One such activity was relating the design features of the airplane in a rational way to the measured handling qualities. Gilruth's research had allowed many of the handling-qualities requirements to be stated in quantitative terms, such as the control-stick motions or forces required for specified maneuvers and flight conditions. I developed theories to predict these quantities based on the dimensions and design features of the airplane. As an example, I calculated the variation of control force and control position with airspeed in straight flight or with normal acceleration in maneuvers. Included in these calculations were the effects of such features as springs or mass balance weights often incorporated in control systems. A flight study was made in the XSBA- I airplane to verify these calculations. This analysis required nothing more than algebra, and though some engineers were no doubt familiar with these effects, it is remarkable that little emphasis was given to these relations in aeronautical engineering courses. Before Gilruth's research, however, the incentive for making such analyses did not exist. FIGURE 4.8. Grumman XTBF-3 airplane, a torpedo bomber used in the war in the Pacific. This airplane had near neutral directional stability at small sideslip angles (0 to 5 degrees) caused by blanketing of the vertical tail by the disturbed flow behind the large greenhouse canopy. The use of a ventral fin restored the directional stability at larger sideslip angles so that the characteristics were not considered dangerous. ....were revised from time to time and I, along with other Langley researchers, was required to confer with officials of the Air Force Flight Dynamics Laboratory and the Navy Bureau of Aeronautics to discuss the revisions to the requirements and to write comments on the changes. One of the more important considerations in designing a new airplane is selecting the size and configuration of the horizontal and vertical tails. Gilruth's requirements for satisfactory flying qualities had given a rational basis for the design of these surfaces, but the application of these requirement involved the calculation of aerodynamic forces on all parts of the airplane and the interference effects of the airplane on the tail surfaces. Before I started work at Langley, Gilruth and Maurice D. White had written a report in which the longitudinal stability was predicted on the airplanes that had been used in the handling-qualities measurements (ref. 4.1 1). The quantity used to compare the predicted and measured longitudinal stability was the variation of elevator angle with angle of attack. This quantity was used because it is measured in flight, whereas the variation of pitching moment with angle of attack, which could be obtained in a wind tunnel, was not available in the flight tests. Remarkably good agreement was obtained between the predicted and flight measured values. This agreement resulted from careful inclusion of all sources of pitching moment, such as the forces on the propeller, the influence of wing upwash on the propeller and fuselage, and the flow field at the tail. The flow field at the tail was based on the detailed studies made in the NACA Langley Full-Scale Tunnel by Katzoff and Silverstein, an excellent example of basic research with applications to airplanes long after the research was conducted. In later years, many other reports were written on prediction of longitudinal stability, but none provided any improvement in the accuracy obtained by Gilruth and White. FIGURE 4.9. Portion of tail area that must be considered ineffective to obtain agreement between calculated and measures variation of rudder angle with sideslip angle (low-wing airplanes). ....stability. The quantity used for the comparison with flight data was the variation of rudder angle with sideslip in steady sideslips, a quantity analogous to the variation of elevator angle with angle of attack in the longitudinal case. This analysis was written as a proposed report and was reviewed by members of the Stability and Control Division. Their conclusion was that the report should not be published because the analysis was too arbitrary and was not based on sound theory or data. An example of the arbitrary nature of the analysis is given in figure 4.9, taken from the report, which shows the amount of vertical tail area that must be considered blanketed by the flow over the fuselage and canopy to give agreement with the flight tests. After examining this figure (and a similar one for high-wing airplanes), the lines defining the part of the tail considered ineffective were drawn according to a set of rules that considered the height of the canopy and whether it had sharp or rounded corners. Obviously, the airplanes with large "greenhouse" canopies lost a lot of directional stability because of the poor flow over the vertical tail. Unfortunately, wind-tunnel data for the effects of the fuselage on the flow at the vertical tail were not available. As a result, accurate analysis of this effect could not be made. Despite the arbitrary nature of the rules defining the effective vertical tail area, the analysis succeeded quite well in predicting the measured variation of rudder angle with sideslip on most of the 19 airplanes that were used in the comparison. I have often felt that the report should have been published, despite its use of arbitrary methods, because the report included many factors that had previously been neglected in designing vertical tails. The report would also have encouraged wind-tunnel researchers to investigate systematically some of the configuration features that led to the arbitrary rules, thereby allowing a more rational analysis. No similar report based on wind tunnel data was ever published. Fortunately, the designers soon found the advantages of much cleaner canopies, such as bubble canopies, in reducing drag so that future airplanes did not have such poor flow conditions at the vertical tail. In recent years, methods based on computational fluid dynamics allow accurate calculation of the flow field over the entire airplane. These methods are known as panel methods, as the entire surface of the airplane is represented by a large number of flat panels that approximate the true surface contours. These methods neglect flow separation, but result in more accurate predictions of longitudinal and directional stability because airplanes have become cleaner as a result of refined aerodynamic design and the use of jet engines. The need for an analysis similar to the one I attempted has therefore decreased.